3 of the last 10 ArcScripts are commercial products with a limited demo period. The more you look at this, the more you see how bad ArcScripts has become. To be honest, ESRI ArcGIS users have paid quite a bit of money and they have no good framework to share just about everything they create. Currently Desktop users can’t share any good MXT templates they have created (or download any that others have created. Users can’t share any models created with the model builder. Users can’t share any Geodatabase schema’s or even UML. ArcScripts has some Python code and extensions/toolbars, but the search function is pretty bad and the interface is difficult to work with. ESRI should take this opportunity to fix the Desktop collaboration options available to ArcGIS users. As bad as it is for Desktop users, ESRI is never going to break into the developer community until the start doing things that developers looks for in a product. ArcScripts has never been friendly to developers and most of us don’t bother releasing are code into it for various reasons. Brian is right on with thinking of a code sharing environment added to EDN. As of right now unless you need the software EDN is of no value to programmers who already have access to Server/IMS/Engine. If EDN had a place where we could share code and collaborate on projects you’d see a huge upsurge in ESRI development. I had a Google Maps API developer email asking where he could get questions answered for ArcWeb Services and I pointed him to the ESRI forums. He laughed and told me no thanks, he’d rather not get involved if that is the only way to work with others (beyond blogging). 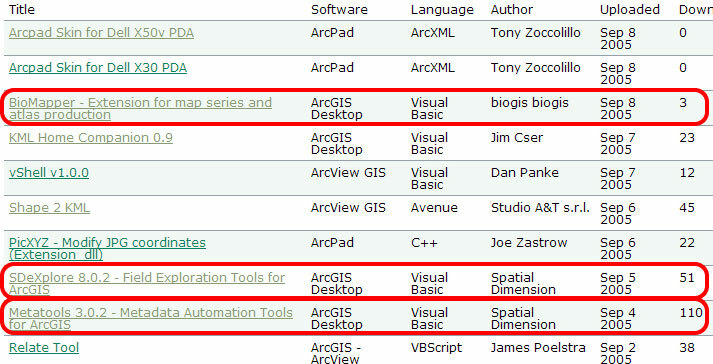 EDN showed many of us that ESRI was serious about developers, but since its release months ago we really haven’t seen much. Too bad for us.